Difference between revisions of "Tips"
This page contains some hints on how to learn a (mostly) unwritten language. You might be tempted to seek out written materials, but this complicates the task of understanding spontaneous speech in real life situations. It is better to shift your orientation and face some initial discomfort. We encourage you to shift yourself from the left to the right. Many people assume a two step process: (1) learn the language through intensive study; then (2) apply what you've learnt with people. However, you won't get far with Bininj Kunwok this way. You need to cast yourself out there, even if it means adopting a different and more outgoing personality. However, you won't get far with Bininj Kunwok this way. You need to cast yourself out there even if it means adopting a more outgoing personality. Try things, make mistakes, have a laugh... if you're not making mistakes and embarrassing yourself regularly, you're not learning. Try things, make mistakes, have a laugh... if you're not feeling awkward or embarrassing yourself occasionally, you're not learning. The language exists for communication and relationships, so make communication and relationships the priority from the very beginning. Remember, the language exists for communication and relationships, so make communication and relationships the priority from the start. Just because someone speaks Kunwok doesn't make them a good teacher. Some people might overwhelm you with information in their enthusiasm to teach you. Start making friends, and see who you can easily relax with over a cup of tea. Remember that language learning is tiring for everyone, so monitor people's level of interest. Sometimes it's easier to focus on learning cultural things, and picking up language alongside that. It is tempting for westerners to engage in "inquiry learning", interrogating the material, understanding it through questioning. In many Indigenous cultures this is not an effective way of working with local to learn the language. It is also not an effective way to learn to speak a language. "A [balanda] and a [bininj] sitting down for the first time for language study experience considerable discomfort. Sustained questioning is probably restricted in all societies to a limited number of settings. In our own we can imagine being questioned by a physician, highway patrolman, income tax controller, census taker, personnel manager, bank mortgage representative, and so on. in this setting we are passive and vulnerable. This is no less true when the questions are put by those with whom we are otherwise on intimate terms, our parents or our spouses, for example. A university student finds little pleasure in being asked a long series of questions by members of his family about his year away in school. The forms it takes are numerous, but its function is always to protect the ego from exposure and vulnerability. Anxieties can also be induced by making the [bininj] believe he is being tested or that he is inferior by comparison with the [balanda]." 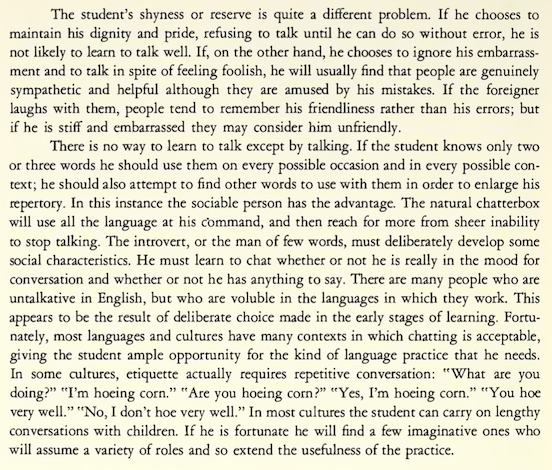 --- William Samarin (1967) ''Field Linguistics''. Learning vocabulary out of context is virtually useless, because you don't get clues to the range of meanings of a word. Memorise phrases, and generalise them by substituting words. If I memorise that a particular word translates as ''line'' in English, does that mean a line drawn in the sand, a queue of people waiting to board a bus, a wire for hanging clothes on, or a metaphorical boundary that should not be crossed? Instead, memorise whole phrases that put a word in context. Then substitute other words into these phrases. Many people start by replacing English nouns with Kunwok nouns, e.g. "what's that ''daluk's'' name?". When your mind offers up to you the thought that "I'm not good at this", replace it with a positive alternative such as "Most worthwhile things are challenging. This is worthwhile." Google [https://www.google.com.au/search?q=learning+journal learning journal] and find some guidance that works for you. Keep a regular log of your thoughts and observations, and learn about your preferences and strengths. Consider blogging about this new journey. Find someone else who wants to learn with you. Meet regularly to share your experiences and ideas. Share any learning resources you create with each other (or on this site). You might be tempted to seek out written materials, but this complicates the task of understanding spontaneous speech in real life situations. It is better to shift your orientation and face some initial discomfort. Consider the following table in https://goo.gl/smus4C We encourage you to shift yourself from the left to the right. NB. It's not about permanently leaving your comfort zone, but just leaving it from time to time. Many people assume a two step process: (1) learn the language through intensive study; then (2) apply what you've learnt with people. However, you won't get far with Bininj Kunwok this way. You need to cast yourself out there even if it means adopting a more outgoing personality. Try things, make mistakes, have a laugh... if you're not feeling awkward or embarrassing yourself occasionally, you're not learning. Remember, the language exists for communication and relationships, so make communication and relationships the priority from the start. It is tempting for westerners to engage in "inquiry learning", interrogating the material, understanding it through questioning. In many Indigenous cultures this is not an effective way of working with local to learn the language. It is also not an effective way to learn to speak a language. "A [balanda] and a [bininj] sitting down for the first time for language study experience considerable discomfort. Each one realizes that he is confronting a human being in a situation which is abnormal. ... Sustained questioning is probably restricted in all societies to a limited number of settings. In our own we can imagine being questioned by a physician, highway patrolman, income tax controller, census taker, personnel manager, bank mortgage representative, and so on. This list of interrogators points out a significant fact about these settings: that the person opposite us is in some official capacity... in this setting we are passive and vulnerable. This is no less true when the questions are put by those with whom we are otherwise on intimate terms, our parents or our spouses, for example. A university student finds little pleasure in being asked a long series of questions by members of his family about his year away in school. In our society one therefore avoids every semblance of a formal interview... Immediate attention must be given to the elimination of anxieties, for anxieties constitute a substantial obstacle to effective communication. ... The forms it takes are numerous, but its function is always to protect the ego from exposure and vulnerability. A person who feels ill at ease in some situation is one who is not certain if he can handle himself to his own satisfaction. ... Anxieties can also be induced by making the [bininj] believe he is being tested or that he is inferior by comparison with the [balanda]." --- William Samarin (1967) Field Linguistics. Learning vocabulary out of context is virtually useless, because you don't get clues to the range of meanings of a word. If I memorise that a particular word translates as line in English, does that mean a line drawn in the sand, a queue of people waiting to board a bus, a wire for hanging clothes on, or a metaphorical boundary that should not be crossed? Instead, memorise whole phrases that put a word in context. Then substitute other words into these phrases. Google learning journal and find some guidance that works for you. Keep a regular log of your thoughts and observations, and learn about your preferences and strengths. Consider blogging about this new journey. Find someone else who wants to learn with you. Meet regularly to share your experiences and ideas. Share any learning resources you create with each other (or on this site).